Where is social media going in 2015/2016…we outline some of the trends for you here. Whether you’re one of the younger generation social media users that seem to use their hashtags for everything but the kitchen sink in an effort to gain followers and likes and in turn popularity. Or, you are a business owner looking to attract the “right” people to your business pages and advertise via your social platforms…social media trends will affect you! Facebook remains the most used and widely spread social network. But as Facebook begins to limit the number of posts fans actually see – so the demand and need for promoted posts increases! Whether we like it or not, advertising on Facebook is going to increase in price as the demand continues to rise. If this marketing channel is right for you, we suggest you make use of some of the advertising options. Test a few different campaigns and see what works in terms of conversion and return on investment. With the introduction of Twitter advertising in South Africa during 2014, came an opportunity for small and medium sized businesses to combine the use of the hashtag with advertising locally, to a targeted group of people. Although this was huge, the astute businesses are researching relevant hashtags and keywords for their business or service and using those to their advantage! By “hopping onto a trending topic” (with a relevant business/service ad), businesses are able to reach a substantial amount of people without having to spend a cent! Both advertising on Twitter and using hashtags will create brand visibility and hopefully give companies the results they are looking for! Google+ is certainly of interest to us and we are intrigued to see where Bradley Horowitz, Google VP will take this. As most people know the “stream” element of the social network never really competed against Twitter and Facebook but the photo sharing and Hangouts features of G+ are definitely key elements not to be ignored. Let’s see what Google has up their sleeve for the 2nd half of 2015. Image based social media marketing is done very successfully on Instagram, this fast growing platform has only recently (not in South Africa as yet) launched “paid advertising”. This unfortunately means that irritating ads we don’t necessarily want to see, will be popping up in-between our mindless browsing and people/brand stalking! The recent emergence of in-feed video advertising will change this platform quite dramatically! – allowing marketers the opportunity to promote their products and or brands to the age, gender and country they wish to. 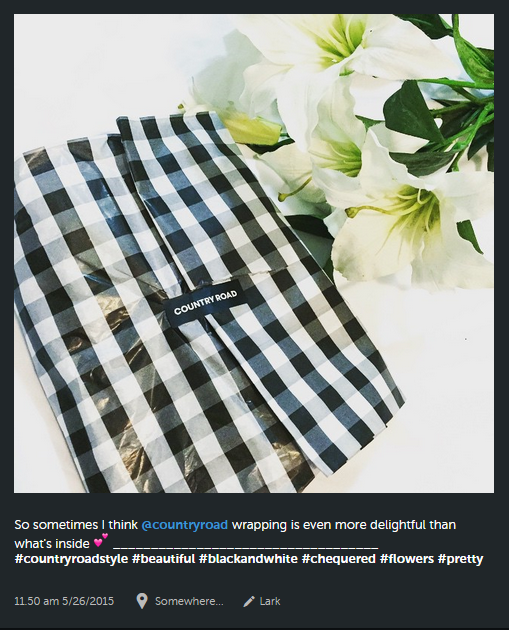 Brands such as Country Road are optimising themselves by including a hashtag (e.g. #countryroadstyle) in their Instagram bio. In doing so they encourage users to advertise their product using the hashtag – this is essentially self-advertising! Customers want to be associated with the brand for various reasons, one of these being “status”. 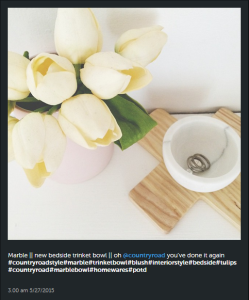 They therefore use the hashtag when posting a new product they bought or used in hope of featuring on the Country Road profile, and thus being exposed to their followers – which kind of works for everyone involved! – It’s a digital symbiotic relationship of sorts! Genius on both ends and an overall win-win! – The best part? Its FREE! LinkedIn definitely falls into its own category but is worth mentioning as it continues to grow and seems to show a more rapid growth rate of followers than any other platform. LinkedIn may not be as popular as some of the other social networks in a “social” sense but certainly has a place in the way of professional social media marketing. The ability for brands to share content and job opportunities with a professional fan base, certainly has a big space in the world of social media. We recommend having a business page on this platform and utilise a good content strategy to talk to potential clients, customers and even job applicants. As we venture into the middle of 2015…the never-ending changes in the digital market place and social media networks, will continue. The success that can be achieved from marketing through these channels will require a great deal of testing on an individual basis to see what works for your business. Stay tuned to see what’s trending in the coming months! For help with your Social Media Marketing, contact MJ Media today.